Finely detailed warrior on horseback holding a Helbard in his right hand. Fully equipped with detailed armor in cobolt blue and turqoise glaze. Other details in white, black and red pigment. A high quality figure, dating to the Middle Ming period, ca. 1500-1550 AD. The figure is part of a group lab tested with the TL test by the Kotalla Lab, guaranteed authentic for life and comes with our COA. Size: ca. 31-32 cm. high and 25 cm. wide. Condition: Superb for type with glossy glaze and complete with no repairs. Scarce Chinese Ming Tomb pottery figure of horseman w Bow! 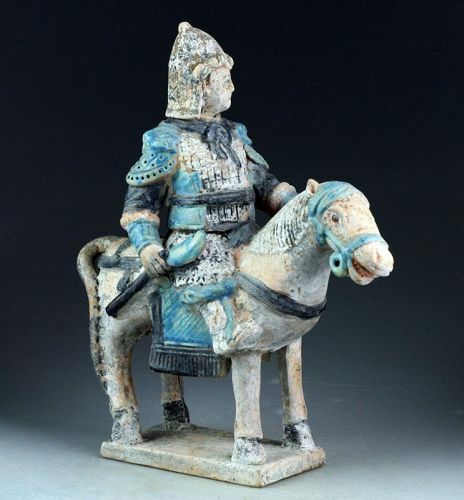 Large Chinese Ming Tomb pottery figure of horseman w. Sword Superb Chinese Ming Tomb pottery figure of horseman w Bow!